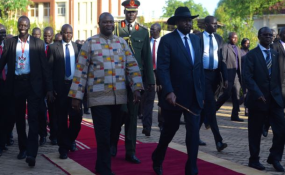 Juba — The Foreign Ministry Peace Administration Director, Ambassador, Hassan Hamed has underlined that the celebration which is organized, todaty, Wednesday, in Juba is a meaage from the IGAD'S leaders that they are united and lined up to support Peace Agreement IN South Sudan State. He explained that the celebration, on internal level, sends a message that Juba will bring together the disputed parties after they ended their disputes. He has indicated to the high level participation in the celebration which represented in the President of the Republic, Field Marshal, Omer Al-Basher who was mandated by IGAD to follow up and supervise all the negotiations. Ambassador Hamed said the cultural and information presence sends strong message that the Sudan and South Sudan media play a key role in strengthening culture of peace and peaceful co-existence.